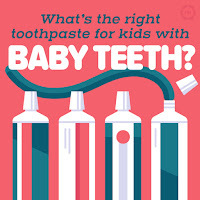 What’s the Right Toothpaste for Kids with Baby Teeth? Life is full of mysteries. Such as, why are there so many kinds of toothpaste? Having a variety is good – but sifting through the multitude of children’s toothpaste (on Amazon there are over 4,000 listings) is downright confusing. 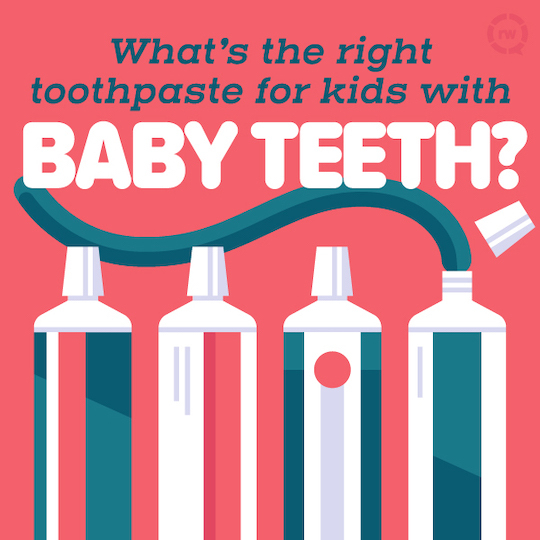 There are a couple key traits that you’ll want to look for when purchasing toothpaste for your child. We’ll break it down for you! In the past, it was recommended that children younger than 3 years old use toothpaste that didn’t contain fluoride – i.e. “training” toothpaste. This was to prevent accidental swallowing of too much fluoride which could cause fluorosis or stomach upset. In 2014, however, the American Dental Association began recommending that all children use fluoride toothpaste. The new recommendation was put in place to combat tooth decay, the most common chronic childhood disease. Decades of research showing the safety and effectiveness of using fluoride to prevent cavities makes this new policy a no-brainer. The most important part of using fluoride toothpaste is to use the right amount: the size of a grain of rice for children under 3 (who cannot yet spit), and the size of a pea for children over the age of 3. A helpful image showing these amounts is in this report from the Journal of the American Dental Association. A toothpaste with the ADA seal of approval will always contain fluoride – so that’s an easy thing to look for. After that, choose whatever toothpaste your child will use! And you don’t have to choose children’s toothpaste either. Choose whatever they like (or tolerate). Experiment with flavors, or have them pick out the one with their favorite cartoon character. Whatever toothpaste they accept works! Just make sure you’re not sharing your tube of toothpaste with your little one. You don’t want to transfer any cavity-causing bacteria to their little mouths. Plus, when sickness goes around, you’ll at least minimize the risk of infecting your whole family with a single tube of toothpaste. Unless your little has a particular sensitivity to specific ingredients, you don’t need to worry about choosing a toothpaste labeled “natural” or one that markets with all the ingredients it doesn’t contain. If you feel more comfortable sticking with a particular brand or avoiding ingredients like dyes or sodium lauryl sulfate (which can aggravate canker sores), then go with that! Just be sure to stick with fluoride! As always, make sure your little brushes twice a day for two minutes at a time, and maintain regular dental visits to ensure a healthy mouth for a lifetime. Visit our Pediatric Services page for more information and videos. 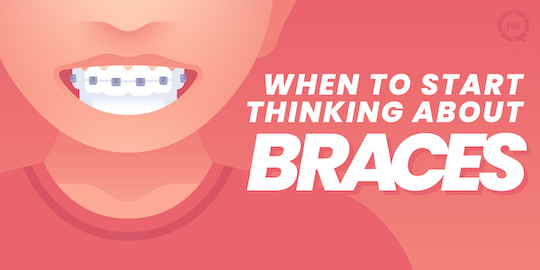 Most of us view braces as one of the awkward parts of adolescence that we’d like to forget. Phrases like “metal mouth” and “brace face” make us cringe as we think our own kids might deal with some of the unpleasantness of their youth. But what if we could get a head start on the process and make everything go a little smoother? Well, that’s just what the doctor ordered! According to the American Association of Orthodontists, a child should be evaluated by an orthodontist by the age of 7. This is when a child’s permanent teeth begin to erupt, which means your orthodontist will be able to spot any issues that may, well, pop up. If your child is older than that, don’t worry! Any time is a good time to make that initial appointment. Many initial consultations with orthodontists are complimentary, so don’t let the cost of a visit keep you away. Your orthodontist will conduct a thorough clinical exam of your mouth to determine if there are any potential issues that could benefit from orthodontic treatment. If that is the case, the next step is to get diagnostic records which will include pictures and x-rays of your mouth. Your orthodontist will then have a digital model of your teeth to determine the best course of treatment. Why start treatment so early? Not all cases will need to start early treatment. Every individual patient is unique, and some types of orthodontic treatment will work best if started after all adult teeth have come in. For others, starting treatment “early” — that is, while baby teeth are still present — will set your child up for a smooth course of treatment over the long run. Early treatment will help guide incoming permanent teeth into the right place and ensure proper jaw development. This prevents overcrowding, impacted teeth, and other unpleasant things. If you notice your child has an underbite, overbite, crossbite, severe overcrowding, adult teeth erupting in the wrong place, or early loss of baby teeth, they might be a candidate for early treatment. No way! While straight teeth are certainly more pleasing to look at, they also prevent a lot of oral health problems. When you get your child on the right track, you increase the likelihood that their natural teeth will last them a lifetime. Plus, technology these days is leaps and bounds better than when we were kids. You might find your child is excited to get their very own set of braces if they get to pick out the colors and shapes – especially if they get to skip part of their school day to do so.